Rick Collins is a patient man. In today's world we've developed an insistent need to photograph everything, everywhere all of the time. Collins picks his spots like a hunter waiting to get the perfect shot. I interview a lot of people with dream jobs, but even I have to admit that this guy has one of the best of the bunch. He's been traveling and living abroad for the past 35 years, working as a screenwriter, a project manager for Norwegian Cruise Lines and as an animal rights consultant, where he traversed Siberia on a circus train.Rick Collins at his "office." Collins spends five months of the year taking groups on photo safaris through Alaska and then travels for the remaining seven months. "I used to do it because I found it cheaper than a mortgage, but I don't know any more," he told me with a laugh as we drove along a bumpy dirt road in Serengeti National Park together. For three months, he is working at the Four Seasons Serengeti Lodge in Tanzania as the photographer-in-residence on one of finest game reserves in the world, an envious position that entails going out on safari with the guests almost every day to help them shoot a lifetime of photographic memories. Serendipity landed Rick this dream job. 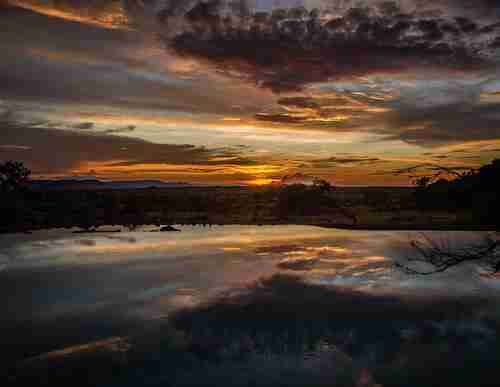 He heard about it from a friend of a friend of a friend who put him in touch with the Four Seasons Serengeti Discovery Center manager Oliver Dreike and the rest just fell into place. Collins' job as the photographer-in-residence is exactly what it sounds like. He helps people take better pictures. The truth is that most people buy an expensive camera right before they leave for a safari vacation and don't take it out of the box until they reach the Serengeti - where they have no idea how to use it. Enter Rick. Collins, who is partial to safari khaki and has the demeanor of your genial uncle just back from a trip into the jungle, is a patient man and over the course of a day he taught me enough about shooting wildlife so that I didn't need to fix all of my pictures in Photoshop and Instagram. Up until this trip, I had been a proud amateur photographer - emphasis on both the proud and the amateur - which means I took a lot of mediocre photos and liked to brag about them. Collins' personal expensive toy is a Canon EOS-1D X. He travels with a 500 lens, a doubler, and a 1.4 extender. He's intense. For folks looking to bring along a starter camera on safari, Collins recommends the Canon Rebel. When he isn't out in the bush, which is just about every other day, Collins can be found giving lectures at the Four Seasons lodge on photography topics like composition and processing. 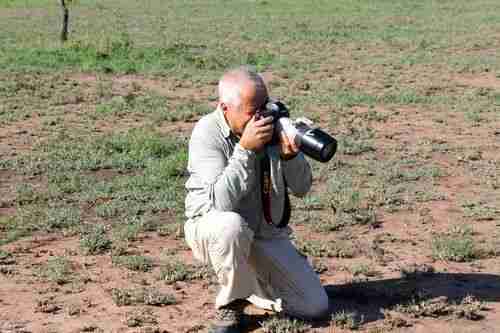 As we spent a day together on the Ikoma Circuit in the Serengeti, Collins regaled me with a piece of advice he gives to all amateur photographers: "Stop centering the animals!" According to Collins, it's boring and being boring is the cardinal sin of photography. The brain reads a photograph much like it reads a book, with the eyes moving and the brain processing from left to right. That means if you get the animal in the left corner of your shot, your audience immediately becomes much more engaged. His other advice: "Pay attention to the eyes." You want to get the animal looking off to the right, so that the viewer's gaze is shifted in the direction of the rest of the scene or you want the animal looking directly at you, to engage the viewer. Here are Collins' other tips, broken down by safari animal. Do as he says and you're sure to bring back some stellar photographic memories. Lions are the king of this savannah and they know it. "They have so much character in their faces. 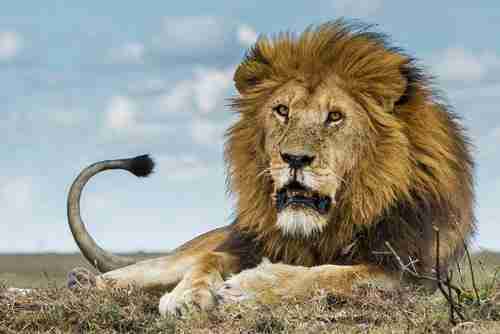 The ideal shot is the lion looking right at the camera with a nice dark mane," Collins explains. "I like to capture them walking toward the camera to give the photo some movement." 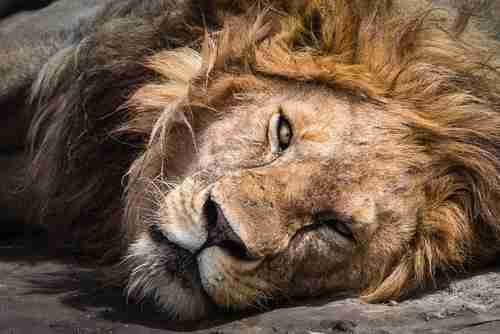 With the lion, even more so than any of the other animals, you want to focus on the eyes. The eyes are where you really begin to tell the lion's story. 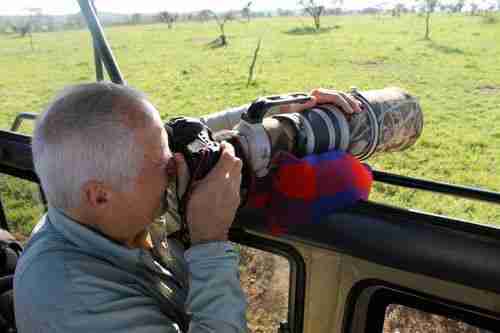 Most safari-goers make the mistake of immediately popping their heads out of the top of the jeeps to take photos. You want to get low. Why? It gives the picture a better perspective. "Change perspective and get the lion at ground level," says Collins. Either shoot out of the window or crack the door and shoot from the floor of the vehicle." 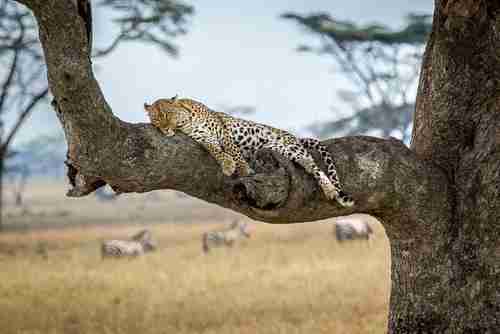 The spotted beauties are some of the most difficult safari animals to shoot because you most certainly want to capture the leopard in its most natural state - lounging in a tree. "Shooting up in a tree is tough," Collins says. "You will always get a lot of sky in the picture, so it is best to use a polarizer. You get so much reflection off of the leaves that it can distract from the animal. The polarizer will help you control the light much better." 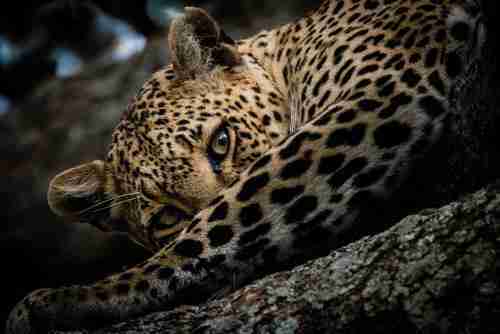 Patience is a virtue with the leopard. Collins will wait for them to move further out on the branch and into the open to capture the light off their beautiful amber eyes. Collins admits that even he has trouble shooting a hippo: "Unless you can get them out of the water - which is rare - the hippo isn't very interesting to shoot on its own," he says. 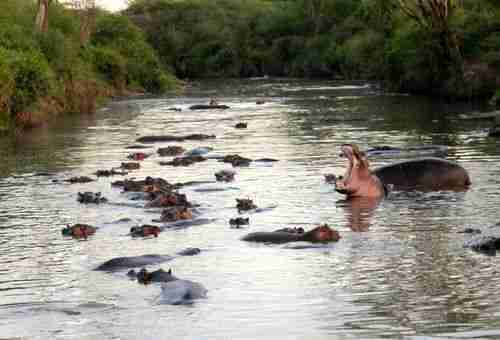 Thankfully, hippos love to lounge around in large groups in ponds and rivers. "You want to shoot a hippo with other hippos. Be patient and try to get an action shot. Two hippos fighting is great. You want to try to see them with their mouths open. Lazing around in the water is nice, but it doesn't make for a great photo," says Collins. "Unless you can catch a hippo baby." Getting a hippo baby out of the water is gold. Unfortunately the only time I saw one was at 4 in the morning, waddling behind her mama in the dark. 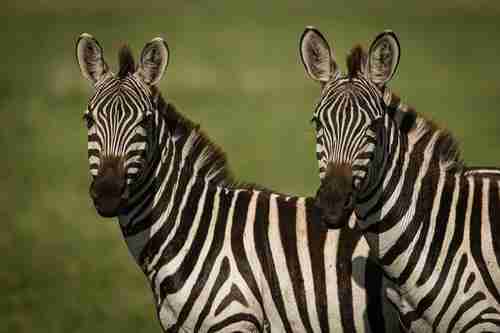 The stripes are paramount in any zebra shot. "Look for the interesting patterns. Don't just get them in a bunch, but wait until the stripes line up. Those are always the best," Collins says. "Just a group of them grazing is a nice habitat shot, but it doesn't do anything for me. Wait until they get to a watering hole and you can start to see the patterns." Our driver Frances had an eagle eye and spotted a cheetah from about three football fields away, her head barely poking over the long wheat-colored grass. 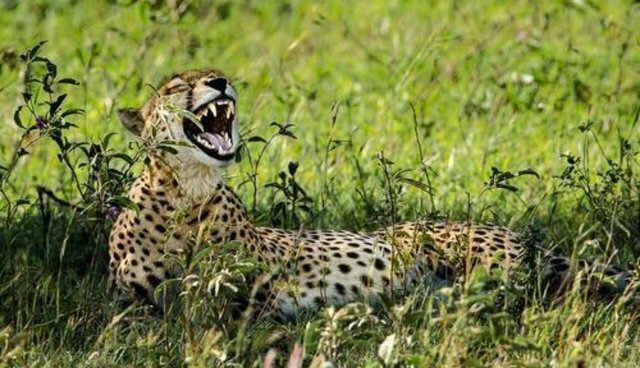 Unfortunately for the waiting photographer, the cheetah spends the majority of the time laying in the grass, waiting to hunt. Collins suggests waiting for it to rise. 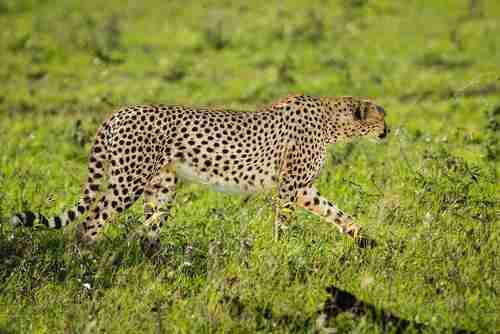 Your mission: to get the cheetah in a full profile, looking off to the right of the picture for added depth. The great thing about the cheetah is that you can often find a mother cheetah with two of her cubs right in the open." A shot of the mom nuzzling the cubs is the best cheetah shot you can get," Collins says. This is where size really matters. Elephants typically roam in packs of varying ages with a larger elephant, many medium-sized elephants and a handful of babies. "You want to get some perspective in order to show the size. 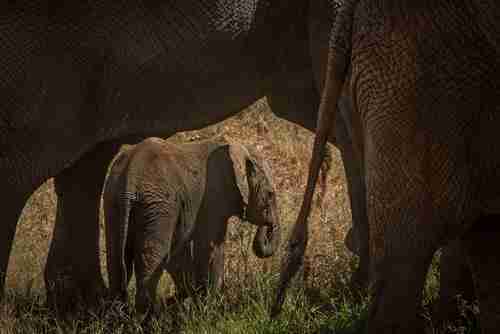 Make sure to get the baby next to the big elephant - otherwise, it is hard to tell how massive they are." Texture also matters. 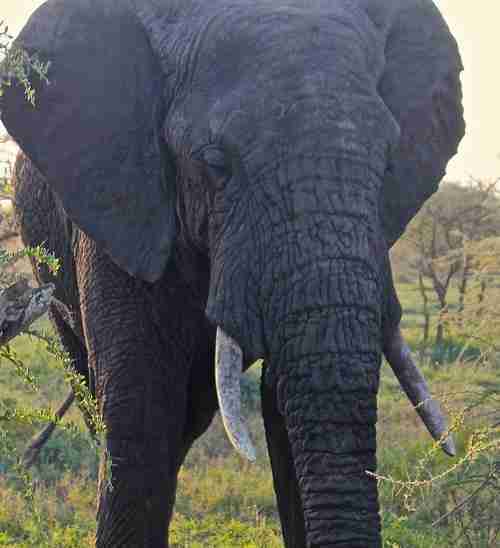 Elephant skin has so much character that you want to zoom in on all of their wrinkles. 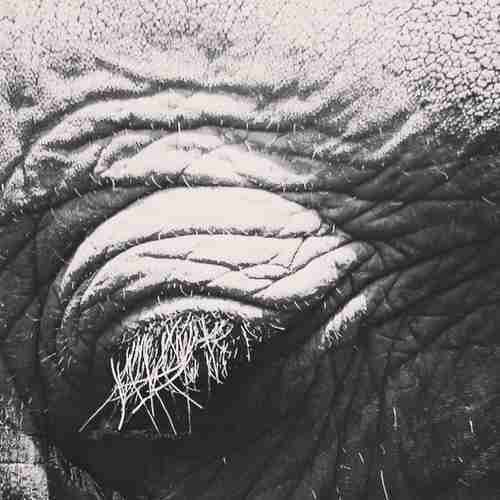 "You can also do a great eye shot of an elephant eye because they have such lovely eyelashes," Rick said. Rick wants to help people capture something more interesting than the stock "giraffe eating leaves" photo. With their heads so far away from the rest of their bodies, these guys are hard to get all in one shot unless you shoot from far away and then you lose some of their character and personality. Collins recommends focusing on one body part at a time. 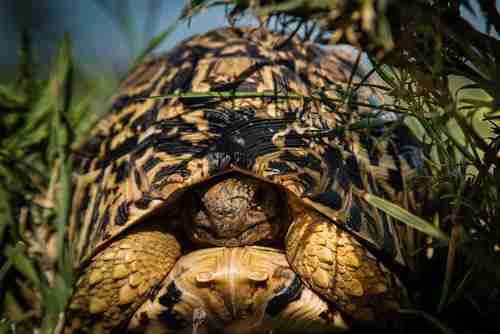 "Get a close-up of the patterns on the back. 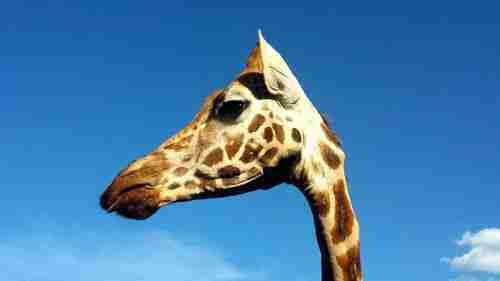 You don't even have to show the giraffe itself. Shoot the Oxpecker riding on the giraffes back or just its face," the photographer says. Collins doesn't shoot pictures on a smart phone. He doesn't have anything against it per se, it just isn't his thing. After spending the entire day together, I can see why it isn't. The modern safari is all about retaining the memories as much as experiencing them. If the retention is important to you then it just makes sense to have someone like Rick along for the ride.